February 11, 2013 By This post may contain affiliate links. 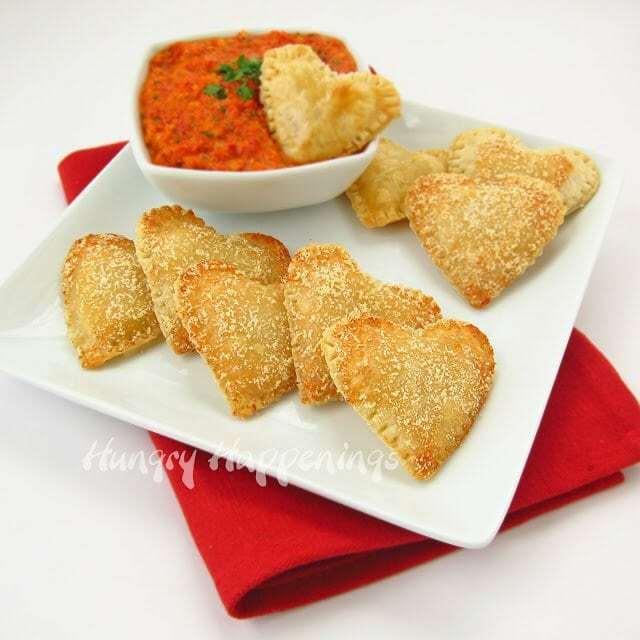 Everybody’s heard of Mozzarella Sticks but how about Mozzarella Cheese Filled Hearts with Roasted Red Pepper Pesto! This dish is perfect for your appetizer loving friends and family, they will enjoy every cheese filled bite. 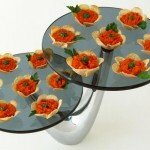 Are you going out to dinner for Valentine’s Day or staying home? We’ll be home. I enjoy going out to dinner, just not on a busy holiday. If you share my sentiment and will be staying at home, these heart shaped appetizers would be a nice start to your Valentine meal. 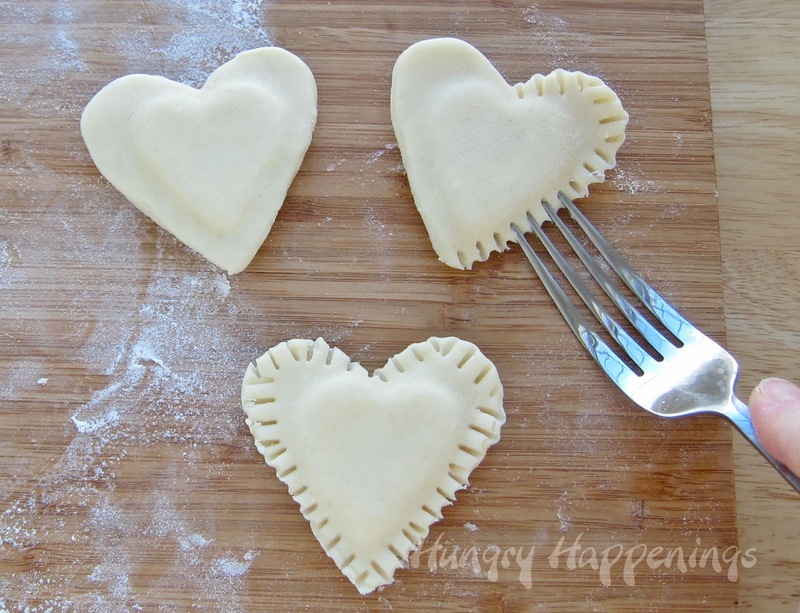 Each savory heart can be created in mere minutes by using store bought pie dough and mozzarella cheese both cut using a heart shaped cookie cutter. 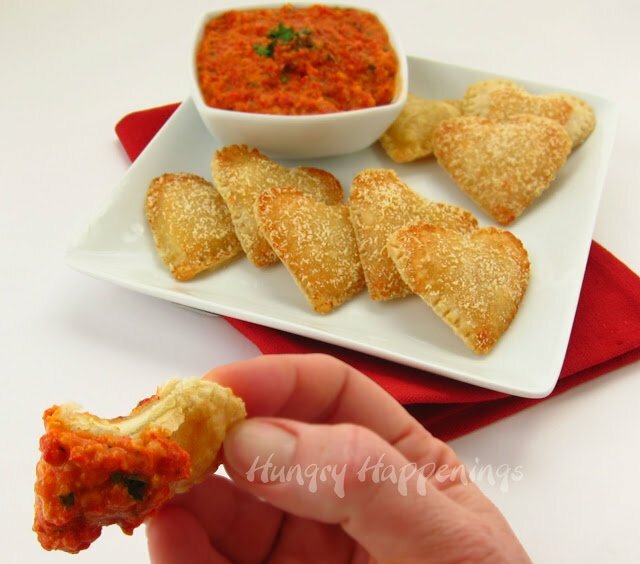 Once baked, you can serve them with a homemade red pepper pesto, like I did, or if you prefer, some marinara sauce. Unroll pie crust onto a large cutting board. 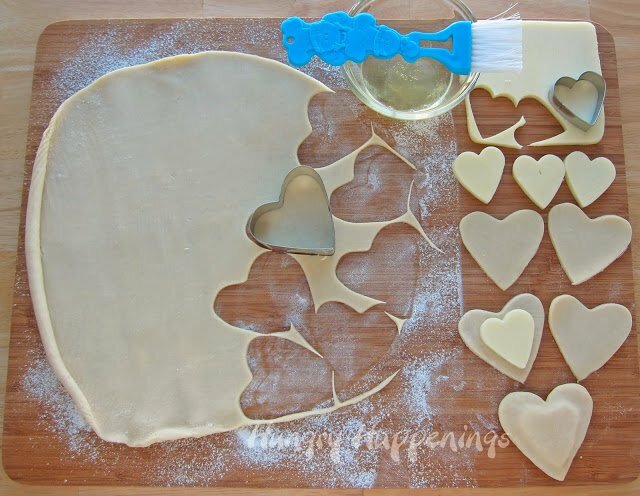 Cut 24 hearts using the larger heart cutter, re-rolling dough as needed. Cut 12 hearts using the smaller heart cutter out of the mozzarella cheese slices. Brush egg white over one dough heart, place a mozzarella cheese heart in the center, top it with a second dough heart, press the edges of the dough together. Repeat. Crimp edges of hearts with a fork. Brush tops of ravioli with egg white. Place on a parchment paper lined baking sheet. 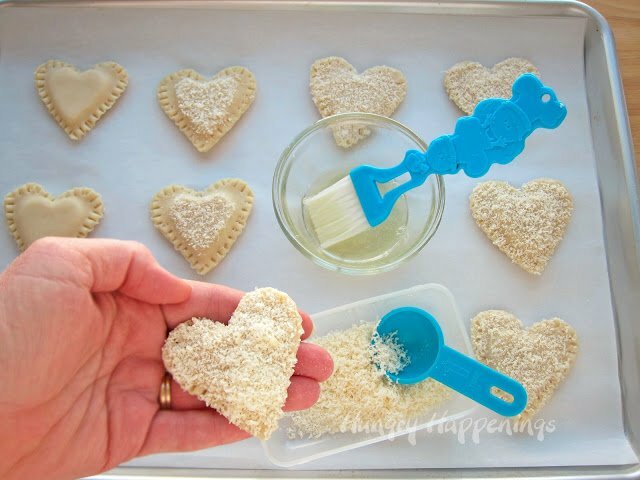 Optional: Sprinkle Parmesan cheese over the tops of each heart. 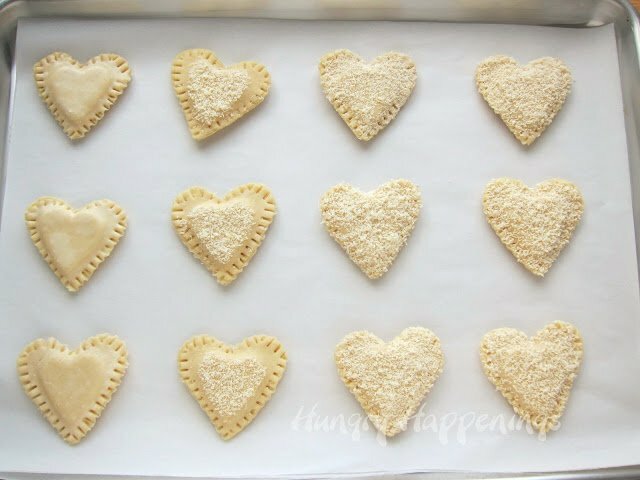 If you prefer you can brush the egg white in a heart pattern on the dough and sprinkle the cheese over top or just leave them plain. I personally like how they look and taste completely covered in the grated Parmesan cheese. Freeze hearts for 15-20 minutes. Meanwhile, preheat oven to 400 degrees and make pesto. Puree roasted red pepper, roasted garlic, roasted almonds, parsley, lemon juice, and 3 tablespoons of parmesan cheese in a food processor, keeping puree somewhat chunky. Add oil and puree just to incorporate the oil. Season with salt and pepper, to taste. Pour into a small serving bowl. If you don’t have a food processor, you can use a blender. If you have neither, then just chop everything really fine and mix it together by hand. The pesto can be made up to a few days ahead of time and kept covered in the refrigerator. Remove the hearts from the freezer and bake for 8-12 minutes until golden brown. Be sure to keep an eye on them during the last few minutes of baking. 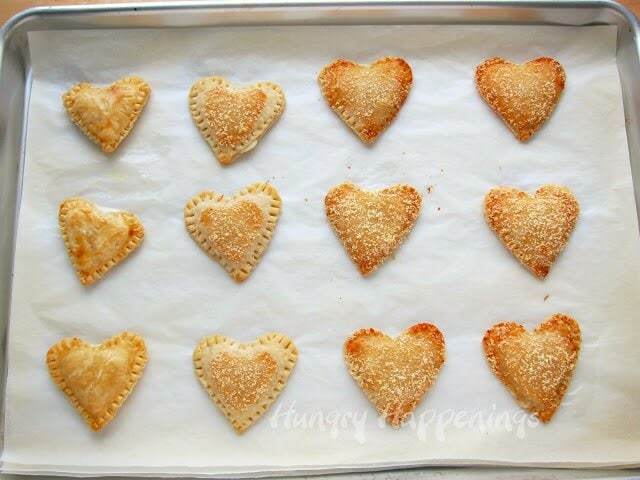 If the cheese begins to ooze out of the pie crust hearts, remove them from the oven. If some cheese does ooze out, you can cut it off using a knife. 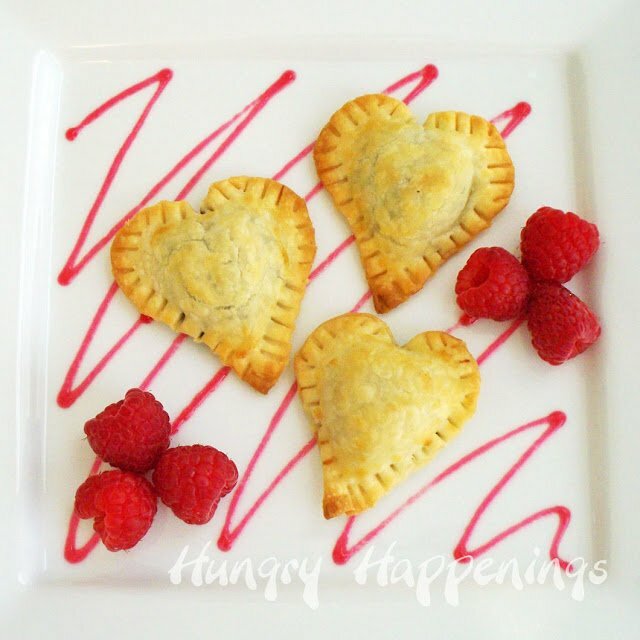 Chocolate Filled Heart Pastries served with raspberry sauce. See the recipe, here. 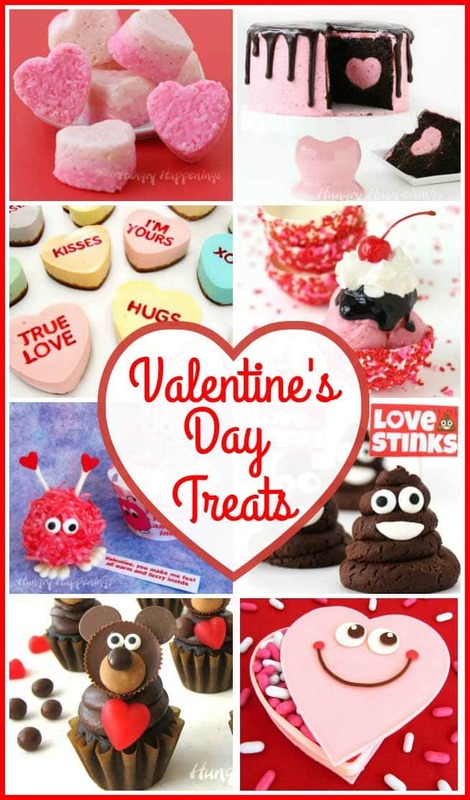 These look delicious and are such a sweet and yummy idea for Valentine's Day! Thanks so much for sharing. I'll be pinning! Oh, that looks really delicious! Aw these are so cute. I love this idea. oh my goodness I'm drooling! These look fabulous! We don't go out on Vday either…way too scary. Oh my, now that's showing the love! I'm from São Paulo, Brazil, and I was introduced to your blog by a friend of mine. Now it's part os my favorite blogs list! Congrats, your work is lovely as well as your posts! 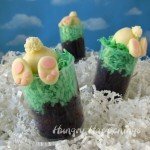 I own a desserts blog and just posted your "Peanut butter fudge hearts", addapted to our ingredients in Brazil and it tasted amazing! Actually, the only ingredient we don't have in here it's the peanut butter morsels. I've made some heart shaped fudges and also some marble bars. I'm so glad you have found and have enjoyed my blog. 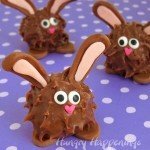 I just stopped by your blog and love how your peanut butter fudge hearts turned out. I really like how you decorated them too. I spent time looking around and was fascinated by all your different desserts. 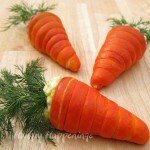 It is so interesting to see the different ingredients used in the recipes. Blogging really is an amazing way to bring cultures together. Thanks for visiting and have a Happy Valentine's Day. Just found you..Love this site! Yes, it's 400 degrees fahrenheit or 200 degrees celcius. Sorry about that, I usually try to clarify that in my instructions. I have reheated them in a 350 degree oven for about 6 minutes or so. I've reheated them in my toaster oven too. Awesome idea and great snack for kid's school lunch!!! Thanks for sharing! Thanks, they would be so fun to find in a lunchbox! This is great! 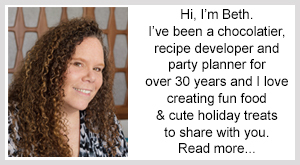 I love your recipe – thank you so much! 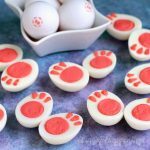 I just made these tonight and would like to have them for our party tomorrow – do you suggest I leave them in the freezer overnight? or put them in the refrigerator after chilling for 20? Sorry, I didn't see this comment until this morning. Freezing overnight would be fine, but you could also just refrigerate them overnight too. You just want them to be nice and cold before baking. 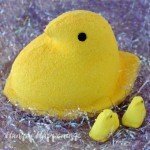 If they are frozen solid, they may require an extra few minutes of baking time.